Eliminate the monthly fees often associated with renting your cable modem from the cable company with the CM1000 DOCSIS 3.1 Ultra-High Speed Cable Modem from Netgear. The CM1000 comes compatible with Comcast cable Internet service and offers enhanced data transfer rates of up to 1 Gbps to support a variety of bandwidth intensive tasks such as streaming multimedia content, downloading large files, and more all at the same time. 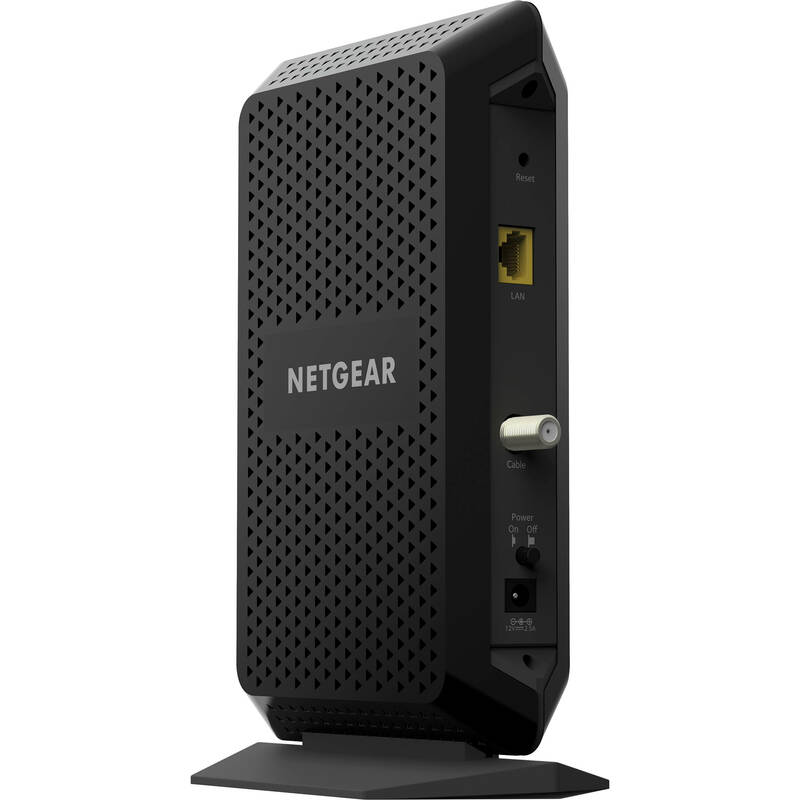 Installation is simple as this Netgear modem comes equipped with both a single Gigabit Ethernet port and a single coaxial connector. Once installed, users benefit from both DOCSIS 3.0 and DOCSIS 3.1 support offering multiple channels for a fast, reliable network connection. Additionally, Netgear has included in this router DOCSIS Quality of Service (QoS) functionality to ensure network resources are allocated to cover more bandwidth intensive tasks for a better overall online experience. Box Dimensions (LxWxH) 10.4 x 7.5 x 4.6"
CM1000 DOCSIS 3.1 Ultra-High Speed Cable Modem is rated 4.2 out of 5 by 22. Rated 5 out of 5 by Anonymous from Must Have! I was told by Cox communications during a recent service ticket that my modem was old and DOCSIS 3.1 technology was now available in my local area. I decided to purchase a modem vs. leasing one. All I can say is Wow! What a huge difference it made in my download speed. Even my wireless network speed increased and when streaming I no longer have delays. It is instant! I am guaranteed 100Mbps but I am seeing 150 Mbps with this new modem. I highly recommend purchasing this modem and running a separate router. Rated 5 out of 5 by Attiyah from The Best Modem In 2018 I have this modem connected to a Nighthawk router and my speed is so fast that I finally feel like Im getting what I pay for. All of my TVs stream video, and my network can be demanding at times and this modem steps up to the demand. I never had issues like some have claimed. I recycle my own system every Sunday morning before the entire house is up and everyone is on a device or TV. But thats been my practice for years because every system should be rebooted from time to time. The added incentive is that Im not charged every month to rent the modem from the cable company. If you need an upgrade that will last you the next two to three years. This is it. Rated 4 out of 5 by Chicago Gig from Solid product I purchased the CM1000 to replace a rental modem I received from Comcast. I have traditionally used Arris SurfBoard modems, but they do not have a DOCSIS3.1 modem that supports my XFINITY Gig service. The product works as it should, and speeds are comparable to the rental unit. PROS * There is a small power button on the back * The system uses the same admin GUI that their routers (e.g. R7000, R8000, etc) use, though there are very few things to see within the interface. * The modem seems to boot much faster than the Arris SB6190, and all lights are green faster than the Technicolor modem I was renting. That said, the time required to get an actual working connection to the outside takes about the same length of time. CONS * The modem is physically larger than the Arris (almost 2X the size of the SB6141/6183/6190 modems) * It has a base that does not detach * The lack of color-changing LEDs means there is less information available from the device itself. My modem showed solid green lights, but my Router showed no internet connection. There is also no change in icon blink pattern/display that would show that the system is still booting or the connection is not fully active. Rated 4 out of 5 by T from Met my expectations. I expected to get faster download speeds and the Netgear CM1000 did that for me. Before and after tests using three different download sites, each performed within a few minutes of each other, showed about a 20 percent download speed increase, up to 170mbps, via a hard wired connection. Wireless download speeds did not show much change, but were still slightly better. The download increase happened while using my same old modem, Netgear WNDR4700. If I paid for a higher internet speed, I believer this device would likely deliver, though I can't prove that. Self-install process with Xfinity cable company was painless and worked the 1st time, with no phone call to them required. Rated 5 out of 5 by Anonymous from I would buy this product again! Works like its suppose to. Puts out great speeds more than what my cable company gives me. Rated 5 out of 5 by Jim H from Much better than the Comcast Modem I bought this to move away from Comcasts' combined router and modem. Night and day difference. I would recommend this modem. Sure, it's more expensive, but with Docsis 3.1 compatibility, this modem should be relevant for quite some time. Rated 5 out of 5 by PGHR from Future-Proof Pays for itself in 18 months and with DOCSIS 3.1 it'll handle current 1gbs xfinity plans and hopefully up to 6gbs in the future. Rated 5 out of 5 by Anonymous from Larger than the usual Xfinity modem This new model Netgear DOCSIS 3.1 was purchased to phase out a rented Comcast DOCSIS 3. All that was needed was to swap out the modems, and when the registration screen pops up when the modem boots, fill out an activation form. Easy. It is pricey for a modem but you get what you pay for. The Netgear modem is about twice the size of the Comcast modem, more like a router. Is this Modem compatible with Spectrum Internet? While the modem is technically compatible with Spectrum, it is not listed on their Authorized Devices list for the Spectrum network, and they do not recommend it. Will this modem with the new 1Gb service from Mediacom ? Is this Modem compatible with wow? Should be if they have Docsys 3.0 as this is backwards compatible. You should call and ask.